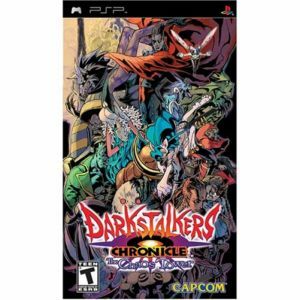 Darkstalkers Chronicle: The Chaos Tower features five different modes of play. Arcade Mode is a seamless conversion where players must defeat numerous CPU-controlled characters. Training Mode gives gamers the option to choose their favourite character and hone their skills. Network Mode allows friends to engage in three different wireless head-to-head networked battles: versus, limit battle and league. Versus offers true two-player competitive matches. Limit Battle randomly assigns a handicap to both challengers, forcing them to strategize their moves in order to claim victory. League allows four players to battle in round-robin mini tournaments where the order of turn is determined by the number of wins and loses. In the new Tower Mode, select three characters from the extensive roster and ascend to the pinnacle of a mysterious tower where many opponents await players. The course taken and fighting conditions will change dynamically based on performance during the multitude of one-on-one battles. Pitting the right competitor against an opponent will be the key to success. Progression through Tower and Arcade Mode directly affects the new Chronicle Mode which is a gallery that houses a collection of unlockable bonus materials that including original artwork and movies. Two selectable screen settings - Change the size ratio of the screen at anytime by choosing either normal or wide resolutions.